HP's BRAND NEW compact 36 inch, web-connected ePrinter; multifunction reinvented. 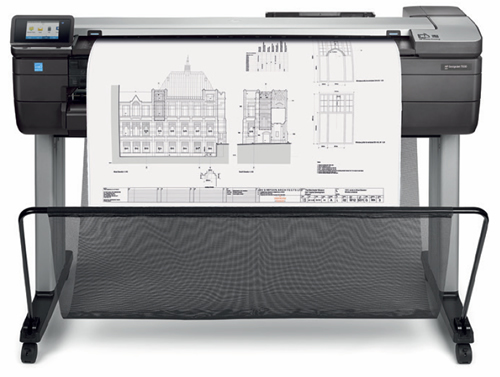 At half the size of any other 36in MFP currently in the market, the HP Designjet T830 is a fast, robust, multifunctional printer capable of transforming your workflow through ease of use and connectivity. It's also highly robust; it comes with hard wearing, terrain busting wheels to cope with relocation from site to site plus a protective rubberised casing is available. Also new to this next generation printer is the addition of dual roll front-loading as well as an output stacking tray to help organise and protect your prints. Half the size(2) built to last, this robust MFP handles activity at challenging sites, even construction. Produces prints 3 times faster than previous HP models - see A1/D-size prints delivered in 28 seconds. Choose from 40 to 300ml HP ink cartridges to fit your print volume, large supplies can reduce interventions. Three times faster than T520 36"
* Based on 36-inch Wi-Fi integrated MFPs available in the market as of September, 2015.
contract for mobile devices. Check with service provider for coverage and availability in your area. See hp.com/go/designjetmobility for more details. 6 The HP All-in-One Printer Remote mobile app is available for Apple® iPad, iPhone, and iPod Touch running iOS v7.0 or later and for Android™ mobile devices running Android™ v4.4 or later. The HP All-in-One Printer Remote mobile app is available for free from the Apple® App Store for Apple® mobile devices and from the Google Play Store for Android™ mobile devices.